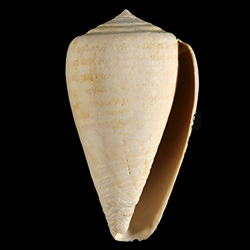 Key morphological features: The Conidae are medium sized gastropods with solid, cone-shaped shells, that have short or medium spires and large, narrow body whorls that taper smoothly from the shoulder to the siphonal notch. The shell exterior often features intricate color patterns, and in most species is smooth, but can also include minor sculpture in some species, such as thin spiral cords. The aperture is very long and thin, and both the labrum and columella are smooth. 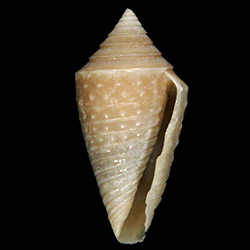 The interiors of Conidae shells are extensively remodeled and lack inner walls. Sources: Davies, A.M. 1971. Tertiary Faunas Vol. 1, second edition. New York: American Elsevier Publishing Company, Inc. 571 pp. ; Tunnell Jr., J.W., Andrews, J., Barrera, N.C., Moretzsohn, F. 2010. Encyclopedia of Texas Seashells. College Station: Texas A&M University Press. 512 pp. Geological range: Paleocene to Recent (Davies, 1971). Geographic distribution: A distributional map for modern Conidae may be accessed from OBIS. 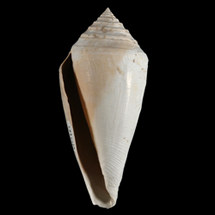 A distributional map for ancient Conidae may be accessed from the Paleobiology Database. Diversity: There are 875 recognized living species of Conidae and 6 genera (WoRMS database, unvetted). The Paleobiology Database recognizes 41 fossil genera and 690 fossil species of Conidae (unvetted). Paleoecology: The Conidae are predatory marine gastropods that use potent venoms and harpoon-like radular teeth to subdue worms, other mollusks, or fish prey, depending on the species. They are typically nocturnal, and live in subtropical and tropical seas worldwide at depths from the intertidal to hundreds of meters. Source: Tunnell et al. (2010); Puillandre et al. (2014). Phylogenetic status: Monophyletic. The molecular phylogenetic analyses of Puillandre et al. (2011), Puillandre et al. (2014), Uribe et al. (2017), supports the monophyly of Family Conidae.